The summer following the first year at RSO, you can perform research under the instruction of a professor. 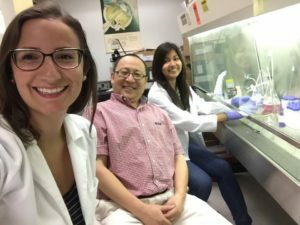 The Summer Fellowship Training Program (SFTP) is an 8-week long program where students can partake in clinical or molecular research in optometry. Having completed research prior to optometry school, I was excited for this opportunity to continue my interest in benchwork. When the program application was released during the spring semester I promptly filled it out in hopes that I would be offered one of the few spots available. Once I was accepted into SFTP, I had a list of roughly 10 projects to choose from. After meeting with multiple faculty members, I chose to complete my research project with Dr. Fortepiani, studying retinal endothelial cells at UT Health San Antonio, Department of Ophthalmology with a fellow RSO student, Miriam Almanza. Many of my peers who were accepted into the program chose to work on other topics such as dry eye, low vision, and military ocular trauma. Pictured below is myself, a lab team member, and Miriam working under the cell culture hood. Half way through the 8-week program all SFTP participants and faculty members would convene weekly for a journal club meeting. These meetings gave students an opportunity to review a similar paper to their project, present their personal project data and identify future intent. 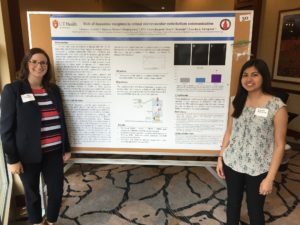 After completing our summer project at UT Health, Miriam and I put together a poster and presented at the UTHSCSA 6th annual Physiology Graduate Student Symposium. Even though I had prior experience in research, many of my peers entered the program to gain new research experience. This program helped provide a connection of laboratory research to clinical practice, as many of these projects will benefit our patients in the future. I especially recommend to those who have never completed research before to consider applying for SFTP; you will not regret it. Janelle is a third year student attending UIWRSO, working as a blog writer to share personal experiences about her time in optometry school.